Even if you spend one week in Rome, you won’t be able to see it all. 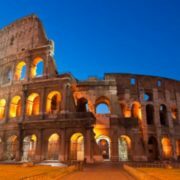 For travelers on the go, though, here is a lightning fast tour of Rome. Morning – Grab a cappuccino and a croissant from a café in the Prati district, which is right by Vatican City. After your quick breakfast, get in line at the Vatican Museum. It opens at 8:45AM, but you’ll want to be in line by 8:00 to avoid the throngs of tourists that will soon be arriving. Start out by proceeding to the outdoor courtyard to admire the ancient statues of Laocoon and Apollo Belvedere. The statue of Laocoon, which is nearly 2000 years old, was hailed as one of the most amazing statues of its time. Next proceed through the stunning rooms painted by Raphael and finish up by being blown away by the Sistine Chapel and terrified by Michelangelo’s Last Judgment. Afternoon – After exiting the museum, head east and pass by Castel Saint Angelo. This giant fortification was often used by Popes during times of war and a lot of fortifications were made by stripping away and melting down parts of the Pantheon. Cross the Tiber and head South East through Piazza Navona. Grab a quick lunch at Baffeto’s, which serves the best pizza in town, and then head further east until you hit the Pantheon. Veer east until you hit Via Del Corso, one of the most famous shopping streets in Rome. Battle the crowds as you head north on the street and soak in all the ridiculously expensive Italian name brands. Night – Hop on a bus to the Trastevere neighborhood, one of the most colorful areas of Rome. Wander around the windy streets until you find a restaurant that is to your liking. There are many restaurants in this area, and the food is generally cheaper and better than any of the other places you’ll find in Rome. After a delicious dinner, snack on some gelato and hike up the nearby Gianicolo Hill to enjoy a stunning night-time view of the Eternal City.